WEB EXCLUSIVE: What the heck is Pedal Punk? Last week, our friends at Centrepointe Theatre approached us about featuring Pedal Punk. It’s BMX bikes, acrobats, and steampunk style, they said. 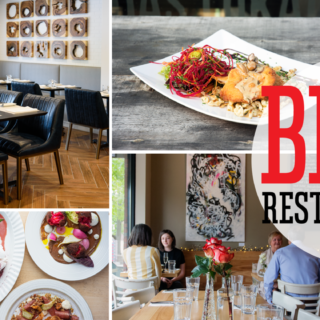 We said, we love those things, but all mixed together? What the heck? Indeed, they conceded, Cirque Mechanics, the group behind the show, hasn’t been to Ottawa before, so it needs a bit of education. Herewith, 10 reasons Cirque Mechanics will blow your mind! There are approximately 90 wheels on stage in Pedal Punk. The aerial Penny Farthing in Pedal Punk can also be used to ride on the ground. It is a real bike! Many of the bicycles in Pedal Punk were built from parts found in scrap yards. A great way to recycle and repurpose parts! The Gantry Bike featured in Pedal Punk as the Bike Shop is an original Cirque Mechanics apparatus, weighs 3,000 lbs. with artists on board, yet it can be pedaled by just 2 people. The Gantry Bike steers like a bulldozer or a tank. It takes a team of 4 people 1 1/2 hours to build the Gantry Bike. It also takes 1 1/2 hours to pack up the whole show. The Gantry Bike has a top speed of 5 mph and can be pedaled indoors and outdoors. 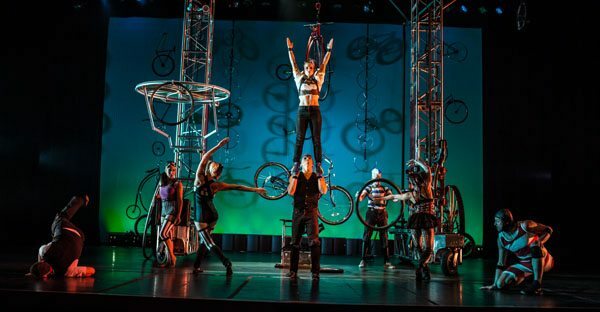 The cast of Pedal Punk is made up of 10 artists: dancers, trampolinists, aerialists, a BMX rider, a juggler and clown, a rhythmic gymnast, a contortionist and a stilt‐walking stuntman. It took one year to create Pedal Punk. The entire show fits in one 26’ truck. 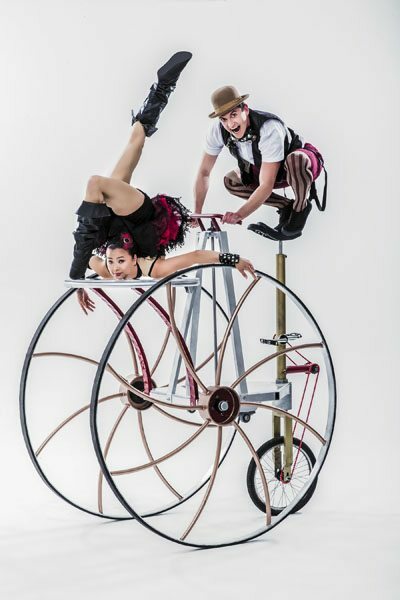 Saturday, May 2, 2015 at 7:30PM, Cirque Mechanics presents Pedal Punk at Centrepointe Theatres. Tickets are $49.75 and are available on centrepointetheatres.com or through the box office at 613‐580‐2700.